Following complaints from local oil and gas companies about the lack of engineers, MP for Aberdeen South, Dame Anne Begg pledged her support to help fix the engineering skills shortage in Aberdeen, and the rest of the UK, by highlighting to young people the many exciting careers available in engineering and technology. Dame Anne has signed up to the Institution of Engineering and Technology (IET) pledge to support engineering in their constituency. Dame Anne said: “Demand for engineers in the UK remains high and nowhere is it higher than in Aberdeen. Employers in Aberdeen involved in oil and gas and the supply chain often raise the shortage of engineers with me as a problem for their business and, with an ageing workforce, there is a pressing need to promote STEM to young people to develop the engineers of tomorrow. “Further, we continue to see more women than men attending university but the level of female students studying STEM remains low. The motivation for the pledge comes in response to findings from the IET’s 2014 Engineering and Technology Skills and Demand in Industry survey, which indicate that 53 per cent of employers believe they should get more involved with schools, colleges and universities to help change the perception of engineering among young people. Anne delivered the key note address at a recent Westminster Employment Forum event where she called on the Government to force insurers to disclose all charges to make a cap work. 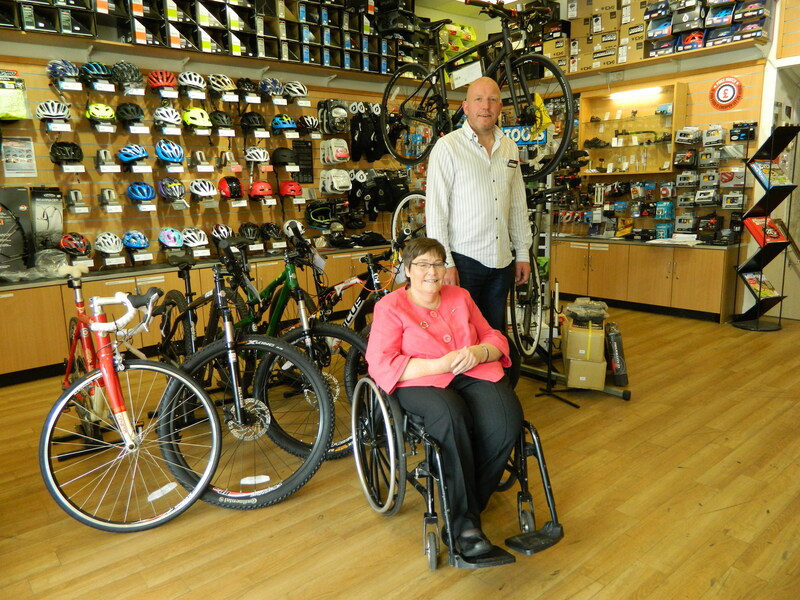 Dame Anne Begg, MP for Aberdeen South, and Frank Doran, MP for Aberdeen North, visited the Edinburgh Bicycle Co-operative on George Street to celebrate Co-operatives Fortnight. With the theme ‘local, loved and trusted’ the fourteen days of Co-operatives Fortnight sees businesses ranging from bike shops to bakers, architects to allotments and farmers to pharmacies, inviting local people to join them in celebrating the fact that they are owned by and run for their members. Up and down the country events are taking place to acknowledge the 6,100 co-operative organisations that are ‘powered by members’ and contribute £36bn to the UK’s economy. Dame Anne joined Scottish Labour Party Leader, Johann Lamont on several site visits this week, alongside local MSPs Lewis McDonald and Richard Baker. They enjoyed a presentation by Dana Petroleum on the company and their project Western Isles for new oil wells East of Shetland. MP for Aberdeen South, Dame Anne Begg is calling for a review of funding criteria to prevent Aberdeen losing out on £6.5 million. Despite successfully bidding for funding from the Urban Broadband Fund 2 (UBF2), Aberdeen City and Shire could potentially lose out due to a lack of agreement over funding criteria. Dame Anne has, therefore, written to the Rt Hon Maria Miller MP, Secretary of State at the Department of Culture, Media and Sport asking her to alter the criteria to allow both local authorities to access the £6.5 million and deliver a world class fibre optic broadband infrastructure for the region. Dame Anne said: “Aberdeen is a dynamic and vibrant city, a world leader in innovative technology, and the UK powerhouse for oil and gas production. Yet, potential development is being threatened by poor broadband speed. “As a strong supporter of the bid for UBF2 funding, I was thrilled when we were successful following the immense amount of hard work and effort that went into our campaign. I continue to receive a number of phone calls from constituents still complaining of poor broadband speeds and I am both disappointed and frustrated by the slow progress in developing super fast broadband for everyone in the region. Not only are big companies being held back by limited broadband speeds, SMEs, which are vital components of the oil and gas supply chain are also suffering. Aberdeen City and Shire Councils are proposing a joint venture which would see a fibre based broadband infrastructure built across the North East boosting the local economy and providing a long term income stream for both authorities. However, a lack of agreement between DCMS and the European Commission indicates that the joint digital strategy proposed by the two local authorities is unlikely to meet the current criteria. The UBF2, also known as the Super Connected Cities Fund, was announced by the UK government in early 2012. In December 2012, Aberdeen was announced as one of twelve cities across the UK to be awarded a share of £50 million in order to provide homes and businesses with fibre optic broadband and high speed wireless Internet access. 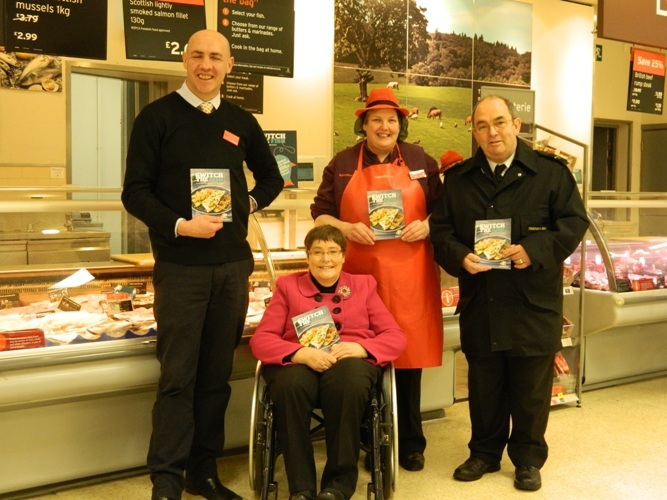 Dame Anne visited Sainsbury’s on Friday to encourage customers to continue to broaden their appetite for fish beyond the ‘Big Five’ species of cod, haddock, tuna, salmon and prawns, which currently makes up 80% of all the fish Brits consume. When a customer asks for one of the Big Five species at the fish counter on ‘Switch the Fish Day’ they can try a lesser known alternative for free. The launch builds on the success of Sainsbury’s first ‘Switch the Fish Day’ in 2011 which saw sales of fish soar by 12% across fish counters on the day. Dame Anne said: “I eat quite a lot of fish and enjoy eating a range of varieties when they are offered in a restaurant. However, when it comes to me buying fish for me to cook myself, I am guilty of sticking to probably only half a dozen species. Dame Anne has welcomed the announcement in the Chancellor’s Autumn statement that Aberdeen will be one of the cities to benefit from a scheme investing £50 million to improve broadband access. She said: “Despite Aberdeen being an economic powerhouse of the UK, some areas in the city still suffer from very poor broadband connections. Today, Dame Anne welcomed the news that the Post Office has secured the DVLA’s Front Office Counter Services contract and has also been named by the Department for Work & Pensions as a provider for its new framework contract to offer identity assurance services. These contracts are a ringing endorsement for the Post Office and will help to ensure that they are able to continue to develop a modern Post Office network in local communities. Following the announcement, Dame Anne said: “The Post Office provides a vital service to local people and I am delighted to see additional services being introduced into Post Office branches, which will ensure that the network has a secure long-term future at the heart of our communities. Dame Anne Begg has welcomed the Royal Mail’s Christmas stamp scheme which launched on 6th November. Royal Mail has a leaflet to every home with details of the scheme and a voucher which customers can use, along with a letter from the Department for Work and Pensions listing the relevant benefits they are in receipt of, to purchase the stamps at any Post Office. Dame Anne said: “I am pleased that Royal Mail has launched this scheme to help those who are in receipt of these benefits and facing extremely tight budgets this Christmas. Customers who require additional or replacement vouchers can call the Royal Mail Customer Service Team on 08456 016 248 or request them through their website at www.royalmail.com/stampoffer.